A clock (from the Latin word cloca, meaning "bell") is an instrument for measuring time. In its most common form, in use since at least the fourteenth century, it displays the time in hours, minutes, and often seconds, during a 12 or 24 hour period. Clocks that are used for telling the time at very high accuracy are usually called chronometers. A common, portable timekeeping instrument for personal use is the pocket watch or wristwatch. By definition, a "true" clock has an announcing or striking mechanism that sounds after each set interval of time. The sound could be the ringing of a bell, chimes, or gong. A silent clock without a striking mechanism is traditionally known as a timepiece, a term sometimes used by horologists and other specialists to describe devices such as ordinary wristwatches (Baillie et al., p. 307; Palmer, p. 19; Zea and Cheney, p. 172). A replica of an ancient Chinese incense clock. The clock is one of the oldest human inventions, requiring a physical process that will proceed at a known rate and a way to gauge how long that process has run. As the seasons and the phases of the moon can be used to measure the passage of longer periods of time, shorter processes had to be used to measure off hours and minutes. The sundial, which measures the time of day by the direction of shadows cast by the sun, was widely used in ancient times. A well-designed sundial can measure local solar time with reasonable accuracy, and sundials continued to be used to monitor the performance of clocks until the modern era. However, its practical limitations—it requires the sun to shine and doesn't work at all during the night—encouraged the use of other techniques for measuring time. Candles and sticks of incense that burn down at, approximately, predictable speeds have also been used to estimate the passing of time. In an hourglass, fine sand pours through a tiny hole at a constant rate and indicates a predetermined passage of an arbitrary period of time. The massive clock on St. Stephen's Tower, London (commonly known as Big Ben]). 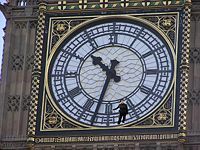 The 5 foot 4 inch (1.63 m) person "holding on" to the six-o'clock marking has been inserted into the picture at correct scale. The hour hand is 9 feet (2.7 m) long, and the minute hand is 14 feet (4.3 m) long. Vitruvius reported that the ancient Egyptians used a clepsydra, a time mechanism using flowing water. Herodotus had mentioned an ancient Egyptian time-keeping device that was based on mercury. By the ninth century C.E., a mechanical timekeeper had been developed that lacked only an escapement mechanism. Later years saw the rise of automated water clocks in Arabia, China, and Korea. None of the first clocks survive from thirteenth century Europe, but various mentions in church records reveal some of the early history of the clock. The word horologia (from the Greek hora, hour, and legein, to tell) was used to describe all these devices, but the use of this word (still used in several romance languages) for all timekeepers conceals the true nature of the mechanisms. For example, there is a record that in 1176 Sens Cathedral installed a horologe but the mechanism used is unknown. In 1198, during a fire at the abbey of St Edmundsbury (now Bury St Edmunds), the monks "ran to the clock" to fetch water, indicating that their water clock had a reservoir large enough to help extinguish the occasional fire. The word "clock" (from the Latin word for "bell"), which gradually supersedes "horologe," suggests that it was the sound of bells which also characterized the prototype mechanical clocks that appeared during the thirteenth century. Between 1280 and 1320, there was an increase in the number of references to clocks and horologes in church records, and this probably indicates that a new type of clock mechanism had been devised. Existing clock mechanisms that used water power were being adapted to take their driving power from falling weights. This power was controlled by some form of oscillating mechanism, probably derived from existing bell-ringing or alarm devices. This controlled release of power—the escapement—marks the beginning of the true mechanical clock. These mechanical clocks were intended for two main purposes: For signaling and notification (e.g. the timing of services and public events), and for modeling the solar system. The former purpose was administrative, the latter arose naturally given the scholarly interest in astronomy, science, astrology, and how these subjects integrated with the religious philosophy of the time. The astrolabe was used both by astronomers and astrologers, and it was natural to apply a clockwork drive to the rotating plate to produce a working model of the solar system. In 1283, a large clock was installed at Dunstable Priory; its location above the rood screen suggests that it was not a water clock. In 1292, Canterbury Cathedral installed a "great horloge." Over the next 30 years there are brief mentions of clocks at a number of ecclesiastical institutions in England, Italy, and France. In 1322, a new clock was installed in Norwich, an expensive replacement for an earlier clock installed in 1273. This had a large (2 meter) astronomical dial with automata and bells. The costs of the installation included the full-time employment of two technicians for two years. The clocks constructed by Richard of Wallingford in St Albans by 1336, and by Giovanni de'Dondi in Padua from 1348 to 1364, no longer exist, but detailed descriptions of their design and construction survive, and modern reproductions have been made. They illustrate how quickly the theory of the mechanical clock had been translated into practical constructions, and also that one of the many impulses to their development had been the desire of astronomers to investigate celestial phenomena. Dondi's clock was a seven-sided construction, 1 meter high, with dials showing the time of day, including minutes, the motions of all the known planets, an automatic calendar of fixed and movable feasts, and an eclipse prediction hand rotating once every 18 years. The Salisbury Cathedral clock, built toward the end of the fourteenth century, is considered to be the oldest surviving mechanical clock in the world. Clock makers developed their art in various ways. Building smaller clocks was a technical challenge, as was improving accuracy and reliability. Clocks could be impressive showpieces to demonstrate skilled craftsmanship, or less expensive, mass-produced items for domestic use. The escapement in particular was an important factor affecting the clock's accuracy, so many different mechanisms were tried. Spring-driven clocks were developed during the fifteenth century, and this gave the clockmakers many new problems to solve, such as how to compensate for the changing power supplied as the spring unwound. During the fifteenth and sixteenth centuries, clockmaking flourished, particularly in the metalworking towns of Nuremberg and Augsburg, and in France, Blois. 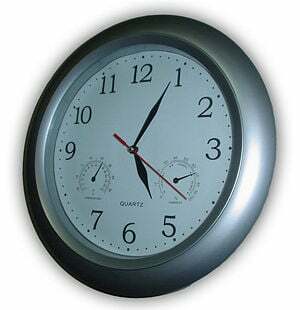 Some of the more basic table clocks have only one time-keeping hand, with the dial between the hour markers being divided into four equal parts making the clocks readable to the nearest 15 minutes. Other clocks were exhibitions of craftsmanship and skill, incorporating astronomical indicators and musical movements. The cross-beat escapement was developed in 1585 by Jost Burgi, who also developed the remontoire. Burgi's accurate clocks helped Tycho Brahe and Johannes Kepler to observe astronomical events with much greater precision than before. The next development in accuracy occurred after 1657, with the invention of the pendulum clock. Galileo had the idea to use a swinging bob to propel the motion of a time telling device earlier in the seventeenth century. Christiaan Huygens, however, is usually credited as the inventor. He determined the mathematical formula that related pendulum length to time (99.38 centimeters or 39.13 inches for the one second movement) and had the first pendulum-driven clock made. In 1670, the English clockmaker William Clement created the anchor escapement, an improvement over Huygens' crown escapement. Within just one generation, minute hands and then second hands were added. The excitement over the pendulum clock had attracted the attention of designers resulting in a proliferation of clock forms. Notably, the longcase clock (also known as the "grandfather clock") was created to house the pendulum and works. The English clockmaker William Clement is also credited with developing this form in 1670 or 1671. It was also at this time that clock cases began to be made of wood and clock faces to utilize enamel as well as hand-painted ceramics. The development of electronics in the twentieth century led to clocks with no clockwork parts at all. Time in these cases is measured in several ways, such as by the vibration of a tuning fork, the behavior of quartz crystals, the decay of radioactive elements, or resonance of polycarbonates. Even mechanical clocks have since come to be largely powered by batteries, removing the need for winding. Analog clocks usually indicate time using angles. The most common clock face uses a fixed numbered dial or dials and moving hand or hands. 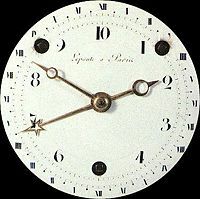 It usually has a circular scale of 12 hours, which can also serve as a scale of 60 minutes, and often also as a scale of 60 seconds—though many other styles and designs have been used throughout the years, including dials divided into 6, 8, 10, and 24 hours. Of these alternative versions, the 24 hour analog dial is the main type in use today. The 10-hour clock was briefly popular during the French Revolution, when the metric system was applied to time measurement, and an Italian 6 hour clock was developed in the eighteenth century, presumably to save power (a clock or watch chiming 24 times uses more power). Another type of analog clock is the sundial, which tracks the sun continuously, registering the time by the shadow position of its gnomon. Sundials use some or part of the 24 hour analog dial. There also exist clocks which use a digital display despite having an analog mechanism—these are commonly referred to as flip clocks. A digital clock outside Kanazawa Station displays the time by controlling valves on a fountain. the 12-hour notation with a.m./p.m. indicator, with hours indicated as 12a.m., followed by 1 a.m.–11 a.m., followed by 12 p.m., followed by 1 p.m.–11 p.m. (a notation mostly used in the United States). Most digital clocks use an LCD or LED display; many other display technologies are used as well (cathode ray tubes, nixie tubes, etc.). After a reset, battery change, or power failure, digital clocks without a backup battery or capacitor either start counting from 00:00, or stay at 00:00, often with blinking digits indicating that time needs to be set. Some newer clocks will actually reset themselves based on radio or Internet time servers that are tuned to national atomic clocks. For convenience, distance, telephony, or blindness, auditory clocks present the time as sounds. The sound is either spoken natural language, (e.g. "The time is twelve thirty-five"), or as auditory codes (e.g. number of sequential bell rings on the hour represents the number of the hour, like the clock Big Ben). Most types of clocks are built around some form of oscillator, an arrangement that goes through an endless sequence of periodic state changes, designed to provide a continuous and stable reference frequency. The periods of this oscillator are then counted and converted into the desired clock display. Mechanical clocks use a pendulum as their oscillator, which controls the rotation of a system of gears that drive the clock display. Crystal clocks use an electronic quartz crystal oscillator and a frequency divider or counter. Most battery-powered crystal clocks use a 215 Hertz (Hz) = 32.768 Kilohertz (kHz) oscillator. Atomic clocks use a microwave oscillator (maser) tuned by the energy transitions of elements such as caesium, rubidium, or hydrogen. These are the most precise clocks available. Atomic clocks based on caesium are used as the official definition of time today. Mains power clocks count the 50 or 60 hertz periods of their AC power. Radio clocks receive time signal broadcasts from a radio transmitter (which may be hundreds of kilometers away). The clock can decode the transmission and adjust its hands or display for perfect accuracy. The broadcast radio signals are generated by an atomic clock and typically have a data rate of 1 bit/s. Sundials observe the apparent rotation of the Sun around the Earth as their reference oscillation. They are observed with a solar tempometer. Clocks are in homes and offices; smaller ones (watches) are carried; larger ones are in public places, e.g. a train station or church. 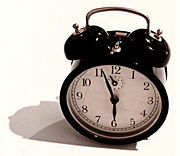 A small clock is often shown in a corner of computer displays or mobile phones. The purpose of a clock is not always to display the time. It may also be used to control a device according to time, e.g. an alarm clock, or a VCR, (see: counter). However, in this context, it is more appropriate to refer to it as a timer or trigger mechanism rather than strictly as a clock. Computers depend on an accurate internal clock signal to allow synchronized processing. (A few research projects are developing CPUs based on asynchronous circuits.) Some computers also maintain time and date for all manner of operations whether these be for alarms, event initiation, or just to display the time of day. 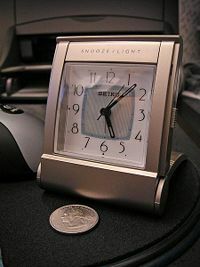 The internal computer clock is generally kept running by a small battery. Memory of this kind is often referred to as "non-volatile." Many computers will still function even if the internal clock battery is dead, but the computer clock will need to be reset each time the computer is restarted, since once power is lost, time is also lost. French decimal clock from the time of the French Revolution. A clock is a recurrent periodic process and a counter. The recurrent, periodic process (a metronome) is an oscillator and typically generates a "clock signal." Sometimes that signal alone is (confusingly) called "the clock," but sometimes "the clock" includes the counter, its indicator, and everything else supporting it. Navigation by ships depends on the ability to measure latitude and longitude. Latitude is fairly easy to determine through celestial navigation, but the measurement of longitude requires accurate measurement of time. This need was a major motivation for the development of accurate mechanical clocks. John Harrison created the first, highly accurate marine chronometer in the mid-eighteenth century. The Noon gun in Cape Town still fires an accurate signal to allow ships to check their chronometers. A windup, mechanical, spring-driven alarm clock. Digital clock display in an oven. Baillie, G.H., O. Clutton, & C.A. Ilbert. 1956. Britten’s Old Clocks and Watches and Their Makers. 7th ed. Bonanza Books. Landes, David S. 1983. Revolution in Time: Clocks and the Making of the Modern World. Cambridge: Harvard University Press. Lloyd, Alan H. 1957. "Mechanical Timekeepers," in A History of Technology Vol. III. Edited by Charles Joseph Singer et al. Oxford: Clarendon Press. Palmer, Brooks. 1979. The Book of American Clocks. London: Macmillan Co.
Tardy. 1981. French Clocks the World Over. Part I and II. Translated with the assistance of Alexander Ballantyne. Paris: Tardy. United States National Association of Watch and Clock Collectors. Federation of the Swiss Watch Industry FH contains listings of links to all participating Swiss Watch Brands and related manufacturers, suppliers, associations, trade magazines, etc, as well as a wealth of related information. Antique Clock Types: An Illustrated Glossary. This page was last modified on 6 March 2017, at 20:40.